Please Note : This product is only available to ship within Australia. If you are outside Australia please choose one of our eBooks which are delivered instantly and electronically to you. * Prices include 10% GST for Australian orders. International orders will have GST removed at the completion of your order. Our Price $36.95 Another currency? Plan and design a home network. 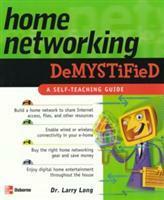 Be an intelligent consumer of home networking products and services. Share resources, including an internet connection, files, printers, videos and images. Secure, maintain, and troubleshoot your home network. Set up digital entertainment features, VOIP telephoning, video surveillance, and telework via VPN. Enter your e-mail below to subscribe to our free newsletter for details on special offers and new releases.